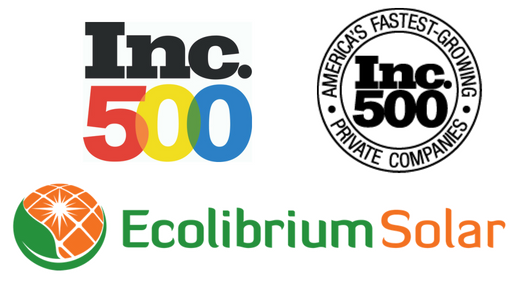 Ecolibrium Solar, maker of industry-preferred simple racking solutions for commercial and residential solar, today announced it has been named to the 36th annual Inc. 500|5000 list of fastest-growing private companies in America. Inc. Magazine ranked Ecolibrium Solar the 443rd fastest-growing private company in the country. To make the list, Ecolibrium Solar grew 989 percent over the past three years, during a period when the economy grew just 6.7 percent. Ecolibrium ranks No. 22 among energy companies on the Inc. 5000. Many energy companies listed are solar installers, but Ecolibrium is the sole solar racking manufacturer listed. The company also ranked No. 12 among the top Ohio companies named to the Inc. 5000. Ecolibrium Solar’s growth story speaks for itself, with more than 600MW installed over five years. The company conducts ongoing product innovation, development and testing at its TUV-accredited R&D lab and offices in Boulder, Colorado. But Ecolibrium is headquartered in Ohio where it originated and remains deeply rooted in the Ohio technology and investment community. While the solar industry continues to face challenges, the U.S. solar market had its biggest year in 2016, according to a recent report by GTM Research and the Solar Energy Industries Association (SEIA). Last year, the nation’s solar installations added more electric generating capacity than any other source of energy for the first time ever. Over the next five years, the cumulative U.S. solar market is expected to nearly triple in size, despite a slight dip expected in 2017, the report says. Ecolibrium Solar holds a strong presence in that success. Ecolibrium is the No. 1 independent manufacturer in the fast-growing rail-less residential racking market and No. 2 in the market when SolarCity’s racking provider is factored in, reports GTM Research. As an independent manufacturer, Ecolibrium provides racking to distributors and solar installers nationwide, helping regional and national installers gain an edge in an increasingly competitive environment. The company offers its EcoX Rail-less Racking System. Rail-less is predicted to see 64 percent growth from 2016-2022. In commercial low-slope or flat-roof racking, Ecolibrium Solar maintains the No. 4 position with the popular EcoFoot Modular Platform that today has more than 200MW installed. Further growth is expected with the addition of the just launched EcoFoot5D High Density 5-Degree Racking System. The high-density system delivers 18.4 percent more power than 10-degree systems. Though the outlook for solar is robust, the industry has a history of an up and down business climate, buffeted by changing government policies and tax incentives, and fluctuating energy prices. Today is no different. With an import tariff being considered on low-priced foreign-made solar panels, the cost of installations could increase significantly, dampening – or dousing – the quest for renewable energy that fuels the growth of solar. “It’s wise to recognize the challenges the current business climate presents. We address those challenges head on every day at Ecolibrium Solar by continually innovating to make a better product and take cost out. I would say the ups and downs of this business make us stronger,” says van der Werff.